Today was cold but sunny so there was no excuse not to get out in the countryside. All the snow from last weekend had disappeared, though this morning’s frost had firmed up the fields. There have been some recent footpath diversions north of Longridge and these were affecting a route of mine, The Longridge Skyline Walk. I therefore took the opportunity to walk some of these paths to update my route description. Parlick with Fairsnape brooding in the background. Standing anywhere in the Loud Valley [The Vale of Chipping] north of Longridge one is aware of the beautiful surrounding scenery. Out to the west is space towards the coast but the remaining skyline consists of hills. Starting in the northwest is the well known Beacon Fell, and going clockwise around the horizon are Parlick, Fairsnape, Totridge, Birkett, Waddington and Longridge Fells. 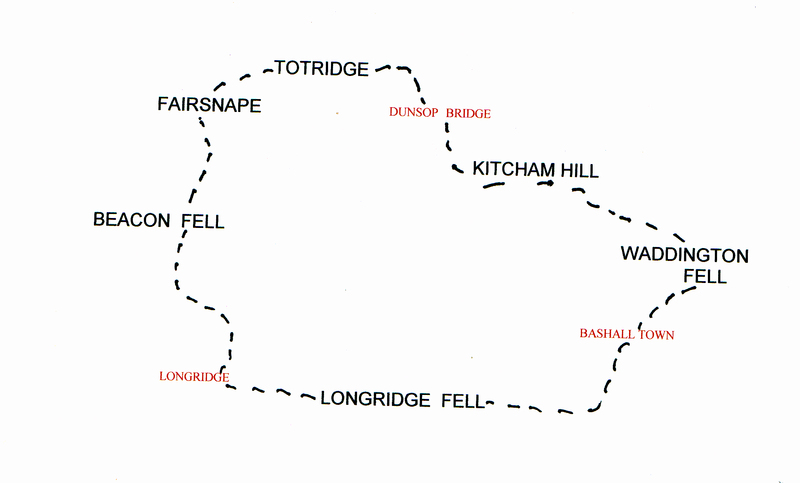 You will notice that these hills are all named using the northern word Fell, it is an interesting fact that Longridge Fell is the most southerly named fell in Britain. Skyline and horseshoe walks have a fascination and draw for fell walkers, think of the many well known examples in our mountainous regions. They are usually fairly obvious in conception and provide a ready made visual and physical challenge. So it was for me, for many years living within sight of this round, and I have taken up its challenge on several occasions in the past, from the 70’s onwards. I soon realised the beauty, variety, relative isolation and rewarding views this walk provides. However there was always a problem with my rounds, I was often trespassing! Large tracts of the moorland areas in the east were private, often with shooting interests, with limited rights of way. So the walk was for private consumption only, but always very satisfying allowing one knowledge of these ’hidden secrets’ of our northern hills. However times change and with the implementation of the CRoW act nearly all the walk was either on Public Rights of Way or the newly created Access Areas. With the publication of O.S.maps showing the newly opened areas I was able to revisit more freely some areas of the walk and realised that a challenging circuit was now more feasible in design and description, if still no easier in physical execution. Thus the 60Km / 37.5miles Longridge Skyline Walk [LSW] was reborn. 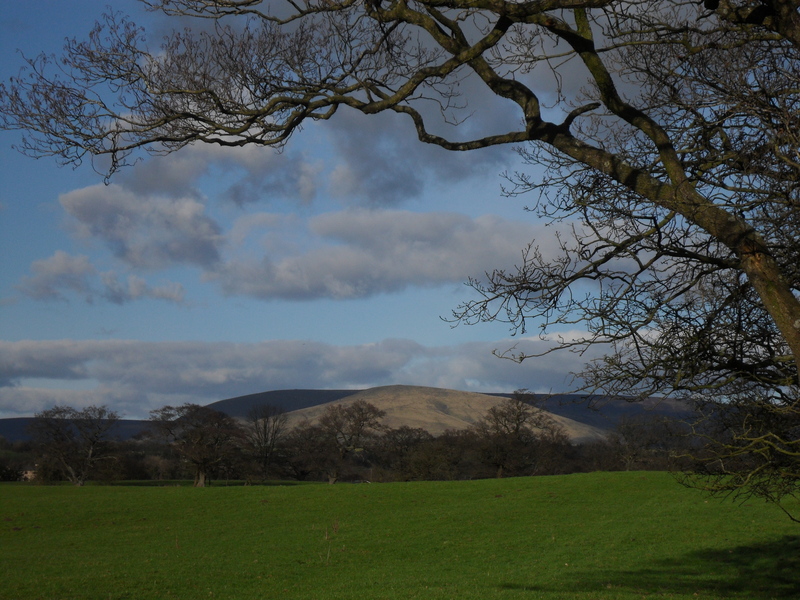 Much of the Forest of Bowland is designated as an Area of Outstanding Natural Beauty and rightly so. Hence many areas are well known to walkers and country lovers alike, but you will find following this round many new corners to be enthralled by and whole areas of rough fell rarely walked in the last few decades. When were you last on Kitcham Hill or Waddington Fell? Bowland’s diverse landscape – heather moorland, blanket bogs, wooded valleys and lowland farms – make not only for interesting walking but also provide a rich habitat for flora and fauna. The area is nationally renowned for its upland birds, so providing one with an opportunity of sighting many species on the walk. Red Grouse, Golden Plover, Lapwing, Curlew, Short Eared Owl, Ring Ouzel, Redshank, Merlin, Peregrine, Kestrel and the Hen Harrier. The latter has become the symbol of The Forest of Bowland. Take a small pair of binoculars. By the nature of the ground to be covered, this walk should not be undertaken lightly, access land in the AONB offers some of the roughest and most remote walking in Lancashire. A sound experience of rough fell walking and the relevant navigational skills are needed. Several miles are trackless and heavy going in the peat bogs. These areas are particularly difficult in the wetter months and are possibly best avoided at those times, not only for your progress but to lessen damage to the fragile terrain. Clear weather is a must really to help with navigation and to enable you to fully enjoy the outstanding views that the walk provides. The access areas may have seasonal restrictions which will be posted locally or found in advance from the usual sources. [Try Lancashire County Council] It would not be possible to take dogs on the whole route. If the walk is started in Longridge the village of Dunsop Bridge makes a good halfway stopover if split into two days. There are limited bus services in the rural areas but Dunsop Bridge is serviced from Clitheroe. Other smaller stages over three or four days can be planned with the limited B&B accommodation in the area. Completing the walk within a day would be a severe challenge for the fittest of walkers and maybe not the best way to appreciate the scenery. There are a few refreshment stops notably Beacon Fell Visitor Centre, Dunsop Bridge Café/PO, Bashall Barn and of course Longridge itself. Starting from the Millennium Cross in Longridge one is soon out into the countryside with early views of the skyline task ahead. After a short stretch of road walking the route goes onto a series of pleasant paths through farming land, both arable and stock. The agricultural changes in recent years are evident with the loss of hedges, expensive barn conversions, diversification with fishing lakes and a new golf course. As the ground rises to Beacon Fell views open up across the Fylde. Beacon Fell was opened in 1970 as one of Lancashire’s first Country Parks and has proved very popular with its easy access and good tracks suitable for all. The information centre is worth a visit as you pass on the way to the summit [266m] with its viewfinder. This summit is the first of the day and hopefully the weather will be clear for the extensive views. Northwards the land now begins to change to rougher pastures approaching the higher fells, again the paths are clear and fairly well used. A wonderful area in spring for the sound and sight of Lapwings. Soon the bulk of Parlick is in front of you, but a winding old peat-sledge track takes you up the quieter side of the fell. The area is popular for gliding, parapenting and model planes so there is usually something in the sky to keep you distracted on the climb. Once at the top the fells stretch out before you and a good walking surface, enjoy it while you can, enables an easy section up to Fairsnape Fell with its shelters and trig point [510m] although the true summit [520m] is further on to the northeast. The enjoyment of the next couple of hours along the ridge to Totridge Fell [496m] will depend on recent rainfall. Although there is a fence to guide you most of the way do not underestimate the difficulty underfoot and detours around the worst peat bogs are unavoidable. On a day of good visibility this is an exhilarating stretch with views to the Lakeland Hills, the vast uninhabited area of desolate fells to the north, the Three Peaks area, Pendle and the Lancastrian Fells to the south. The last legs of this walk over Waddington and Longridge Fells become clear. At the end of the ridge the beauty of the Hodder below you can be appreciated before the steep descent into the valley. The Trough of Bowland road can be busy at weekends but fields lead past a pheasant breeding farm to follow the River Dunsop into the village by its bridge. This a popular destination and after the solitude of the fells the number of trippers can come as quite a surprise, but the ice cream is great! Don’t forget to look at the unique telephone box celebrating being at the centre of Great Britain. This section of the walk covers new ground for most people and being trackless in parts will feel longer than the map suggests. It starts pleasantly along by the idyllic Hodder and then climbs to the exquisite wind blown, untrodden and heather clad top of Kitcham Hill [283m] From here rough moors are crossed to emerge through trees at the historic farm of Crimpton [Our Lady of the Fells] More rough trackless ground is crossed over Marl Hill [311m] heading for the mast [if you can see it!] on Waddington Fell. At one point navigation is helped by an old ditch once serving as a deer boundary for the important Browsholme Estate. Reaching the summit of Waddington Fell [395m] is a relief and most of the harder work is behind you. Once again you have stunning views from an unusual angle particularly good westwards down the length of the valley you have navigating round. Downhill all the way! From the trig point you follow the obvious ridge southwards by the wall and continue down the mapped access area until it stops 0.5km short of the next Public Right of Way. Having overcome this problem field paths lead to the delightful Talbot Bridge, on past an old packhorse bridge and close to the old Bashall Hall. Soon you will be enjoying refreshments in Bashall Barn, the type of farm diversity I appreciate. More field paths bring you to The Higher Hodder Bridge. A short stretch by the River Hodder and then you climb up to Kemple End a well known viewpoint over the Ribble Valley and Pendle. Now for a contrast you enter the sometimes gloomy forest leading uphill. Clearings are reached overlooking the Loud and Hodder valleys for relief until eventually you reach the final top of Longridge Fell [350m]. From the trig point enjoy the views northwards of patchwork fields below and the background of the route you have followed. The long descent to complete the round. If you have been blessed with good weather you will be able see Snowdonia ahead and pick out the Isle of Man Hills across Morecambe Bay with a background of the setting sun. Or then again it may be raining! Following the very edge of the fell you will come to the road at Jeffrey Hill car park. Here there are interesting information boards about the area. There is the suggestion that the river Ribble may have reached the sea through the vale of Chipping at one time, being diverted by glacial deposits to it’s present more circuitous route to the south of Longridge Fell. The road has to be followed past the golf course for a couple of kilometres until you can take field paths towards Longridge. Near the end join the route of the old railway line which took stone from the extensive quarries to supply many Lancashire cities. Soon you are back at the Millennium Cross and maybe enjoying a pint in the Townley Arms reflecting on the last 60km! Contact me if you would like detailed directions. This entry was posted in Beacon Fell, Bowland Fells., Chipping Vale, Long Distance Walks., Longridge, Longridge Fell, Longridge Skyline Walk, Walking. and tagged Beacon Fell, Bowland, Long Distance Walks, Longridge Fell, Walking. on February 2, 2013 by bowlandclimber.